1. West coast with dark sand: Muriwai - the beach and birds, Piha or Karekare - waterfalls and beautifil beaches. 2. 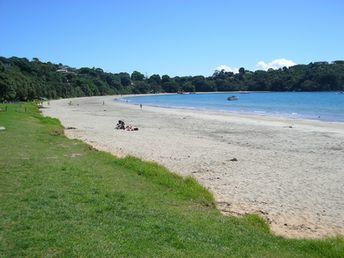 Coromandel Peninsula - Hot water beach with thermal springs, Cathedral cove - nice beach with cliffs in water, white sand and clear water. 3. Package tour to Waitomo caves. If move to the north from Aukland, visit Cape Reinga. It has sand dunes - very interesting. Get by bus to Rotorua. And if you still have some time, then also visit Taupo. It's quite Ok for 3-4 days. If you have only one day, take TAC. You will see 70-80 $ of all of the beauty. But it's often deep fog at TAC route. So think about full TNCT route. Tongariro Northern Circuit Track vs. Tongariro Alpine Crossing?